I've been a little uncertain about what my B would be this week. It went from breakfast to beauty to bedtime routine. I finally settled on burger after my trip to Five Guys this week. I'd heard lots about it, mainly from this blog post from The Londoner, so I was excited to try it. This isn't one of those posts with mouth-watering, beautiful photos of elegant looking food. I was in a rush to catch the latest Hunger Games film so the only photo I took was the one above, which I edited for my Instagram. Anyway, there's nothing good looking about this food but boy, it's good! Five Guys was huge in America following its opening in 1986 but it was only until 2013 that it came to London in Covent Garden. They have Five Guys and Shake Shack (another place I'd definitely recommend) so all your burger needs are catered to. I used to hate burgers until a year or two ago. Now I can't say no to a big juicy burger, and Five Guy's offering satisfies every need. There's 15 different toppings! Yeah that's right, 15! However, I just stuck to boring lettuce and tomato. I'll probably branch out more next time. The chips are probably some of the best I've tried - the right amount of salt and crispiness. I found myself getting full from the burger but was able to eat nearly all the chips. They were just so good! One of the only things standing against Five Guys would be the price. It does seem quite expensive at first glance but it's most definitely worth it. Next time you're around one of their restaurants pop in for a quick burger, hotdog or even a sandwich. Even my plain hamburger with boring toppings was tasty! You can't go wrong. This isn't how I'd usually write a review of a restaurant but I didn't have my blogger cap on so didn't take any photos. It's just a quick recommendation after really enjoying it this week. 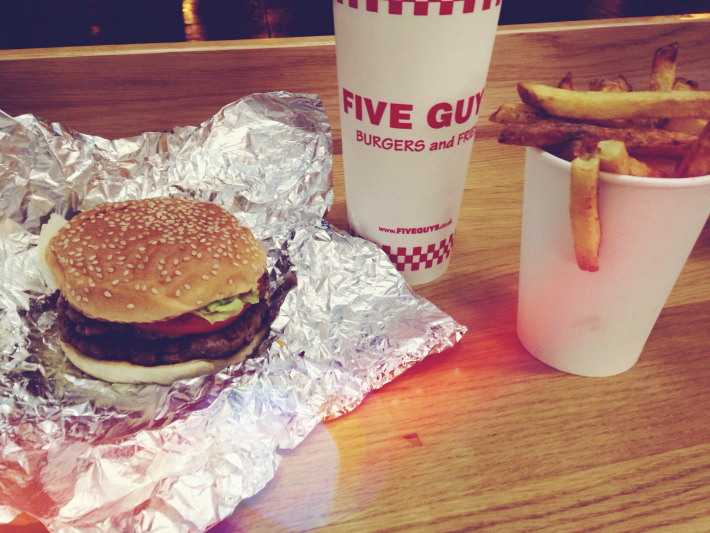 Let me know what you think of Five Guys! I still need to go considering there's one right round the corner from work! I'll treat myself this week!